It is with great trepidation and very little pleasure that I begin this next chapter in the life of the great Maximilian Standforth. For many long months I have debated with my soul and conscience on whether to share this work with you, faithful reader. But in these hard times, my wallet and empty stomach have forced me to share this chronicle no matter my misgivings. Yes, hard times have forced my unsteady hand and pen, but I will share no more of that now. It’s not important. If it comes, it will come later in these pages. For now, let me warn you of the morbid and sad tale ahead of you. This is a tale filled with horror, dark passages, ghostly apparitions, and deaths I would give my last shilling to forget. A tale, I am sad to say, that even tested the mind of one of our country’s greatest citizens…. The outcome of that test you will see shortly if you dare continue. This story begins in the later end of 1864. I had been in the employment of Master Standforth for four years and we had already shared the adventures you have read in the previous installments. The world was changing, nervous on what was to come. While our papers were filled with the exploits of the war in the colonies, our London was growing darker under the ashes of our industries. New financial barons were rising, challenging for the first time the noble classes that had ruled our empire for centuries. You could feel the uncertain change in the air, in the heavy fog and rain. It had been a quiet three months in my employment with hardly an adventure in sight (save the odd, uncomfortable position the rambunctious Maximilian can bring to an evening). My job followed the simple monotony of delivering the morning paper (which he never bothered to read), taking care of his horse (Miss Elizabeth), being ready for the possibility of another evening outing (for his drinking and social visits to friendly female establishments) and doing my best to stay out of the path of his beautiful maid, Miss Maggie Collins. After the exposure of my true emotions to her in our last adventure, I had been avoiding her as best as I can… and sadly, I must admit, I had been very successful at it. So it will come as no surprise my astonishment one morning when I found her quietly watching me from a short distance as I brushed the mane of Miss Elizabeth. How long had she been there? Her small and delicate hands were carrying what looked like the mail. Did she stop to see me on the way back up to the rooms? I jumped at the striking vision, did my best to regain my composure and gave what I could only hope looked like a welcoming smile. Can I help you, Miss. Collins?” I asked with the short hint of a bow of the head. She nodded back to the house. She was delivering a message. It wasn’t a social visit. That fact did relax me a little, but only a little, while also pulling at my tender heartstrings. This visit was not by her choice. It was an odd request to receive upon entering a room, even when one has been in the employment of Maximilian Standforth for four years; however, the request had an odder feeling since he was waving two loaded pistols in the air as he asked. He had always been fond of those particular weapons. They were a gift from an earlier happy client in a case that took him to the now ungoverned and degenerate south of the colonies. What he always added at the end of that little story is he didn’t need to be given the pistols. The client’s wife had made more than enough of a “payment” for his investigative work. “Excuse me, sir?” I asked, trying to stay out of the line of the waving arsenal in front of me. His excitement was strange and he bounded from spot to spot in his dirty and luxurious rooms. The living room had the thick smell of tobacco, alcohol and something else I care not mention. It had clearly been too long since his mind was truly active. “A painting, my good man. A painting! Name one,” he said quickly. Maximilian stopped his agitated (and possibly drunken) movement and gazed at me closely. “You know that makes perfect sense,” he replied slowly. I did not have to time to register what he meant exactly, since he was in motion again; waving me into the room with one gun and then showing me an empty artist’s easel in front of him with the other. I sat down on his dirty and extravagant couch and looked up at my master with a stunned expression, my natural expression whenever in his presence. Maximilian nodded, looked away and then back at me. “Bob, art is an illusion,” he said, speaking in a fashion one would use in addressing a child. “I don’t…” I began to say. “A theory? Pish!” He paused and then leaned back in the chair and with a moan exclaimed. “Fine then, I am bored.” He moved his head up to look back to me, his wild eyes flaring with excitement and glee. He jumped back to his feet and walked over to the easel with the blank canvas in front of it. He stared at it intensely as he spoke. “It would be so easy, Bob, so easy. We steal the work. We bring it back here… I then…” He crookedly pointed both his guns at the canvas and shot! Luckily, I was saved from answering the question put forth by the harsh clang of the front door bell. I nodded in understanding. I got up and slipped five pounds from his purse, certain that was enough for a bribe, and certain that a constable wouldn’t expect any less knowing the eccentric resident. That resident in question continued to walk around the destroyed easel, certainly picturing with glee the Mona Lisa with one less eye and less of a grin. I could hear the soft steps of Maggie approaching on the stairs. I instantly straightened up and moved closer to the door. My master paid no attention to the approach and continued speaking to himself. “We could move on to sculptures, just imagine the fun a carefully aimed bullet could have with that? We could shoot the fig leafs right off.” He was certainly enjoying himself. He stopped and nodded with a twinkle in his eyes. “We could even start to terrorize living artists…” He giggled as his mind filled with many new malevolent thoughts and turned back to the destruction…. 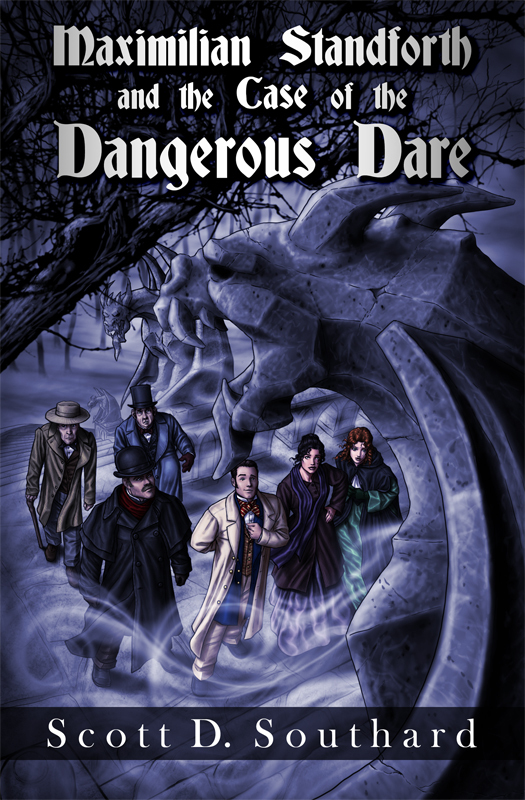 Maximilian Standforth and the Case of the Dangerous Dare is a free eBook for only a limited time! You can find it on amazon here (http://www.amazon.com/Maximilian-Standforth-Case-Dangerous-Dare-ebook/dp/B00CXSDEBE/ref=sr_1_2?ie=UTF8&qid=1400851518&sr=8-2&keywords=Scott+Southard). This entry was posted in Books, Fiction and tagged Amazon, British, Detective, eBook, eBook Deal, Fantasy, Free, Free eBook, GoodReads, Google Play, Horror, Jasper Fforde, Kindle, Murder, Mystery, reading, Sherlock Holmes, Supernatural, Surprising, Thriller, Unpredictable by Scott D. Southard. Bookmark the permalink. Hi, Scott. Wanted to let you know that I couldn’t get your link to work – you might want to double-check it. Argh! Thanks for the catch. Links to Amazon via blogs can have issues. I went ahead and changed it from tiny version to the full link. Hopefully, that will solve the problem.